Sapphire jewellery isn’t all blue! 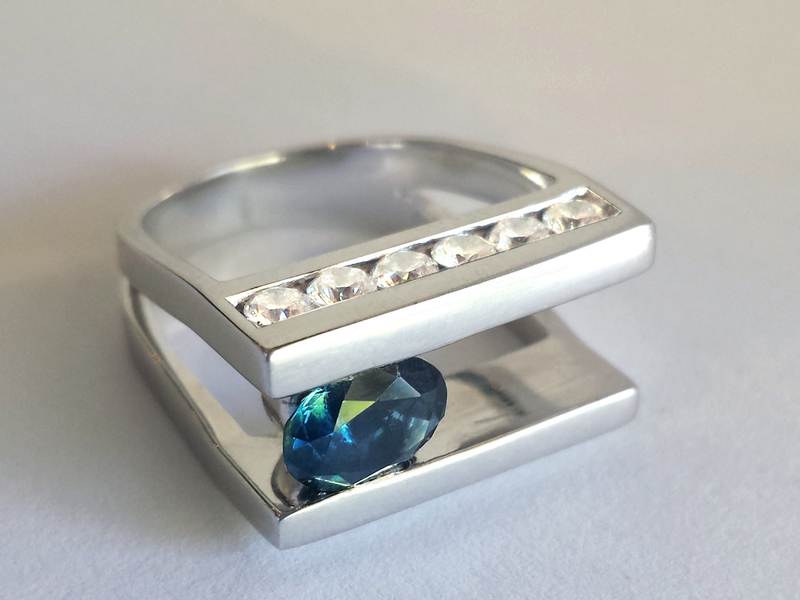 At Bilingual, we love to use a range of colour in our sapphire jewellery designs. 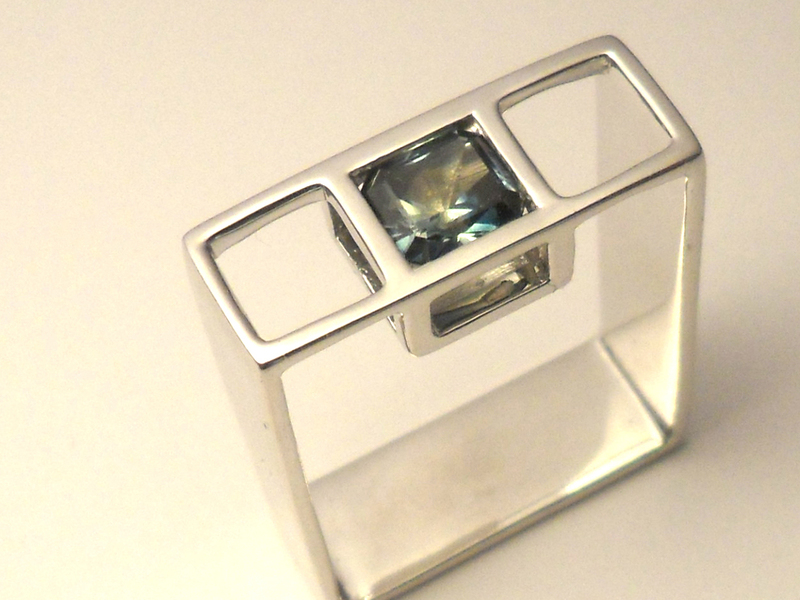 The gemstone offers a great strength, versatility and colour range! With such wonderful and exciting design possibilities, it’s no wonder that they feature in our designs more often than any other stone, besides diamonds. Colourless white sapphires pick up the colours around them – including their setting. They are a beautiful gemstone, and while they are both rare and durable, they are more affordable than diamonds and a great gem choice for many jewelry designs. 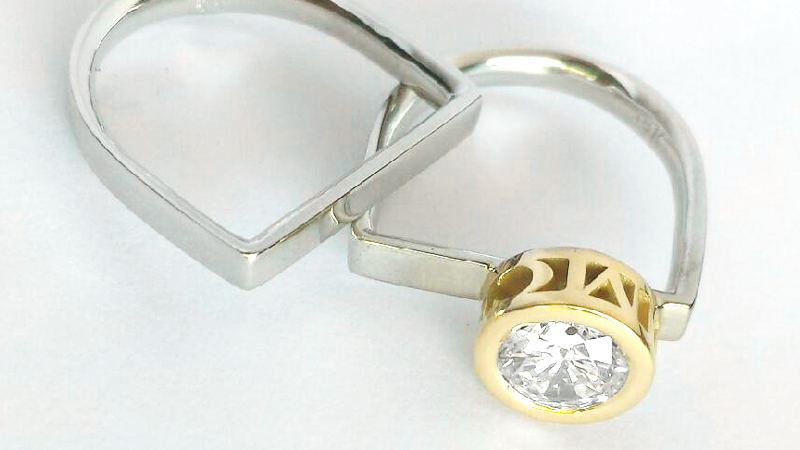 Here, they sparkle in our ‘Milestone‘ earrings and ‘Cradle Stone‘ ring. 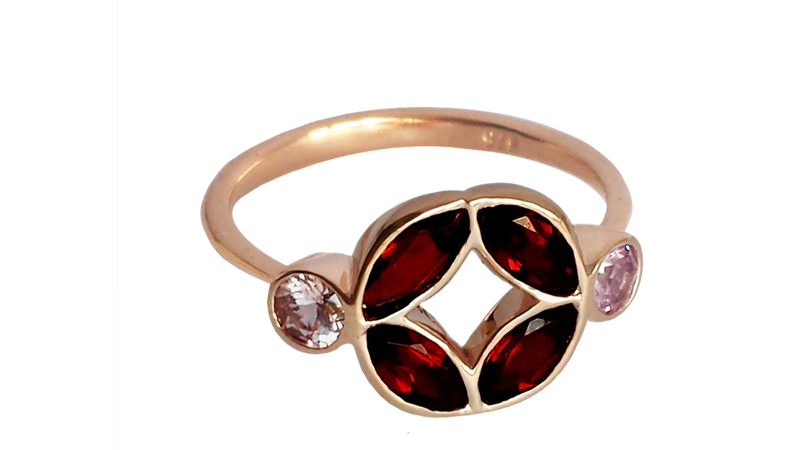 Two brilliant pink sapphires feature in our lovely Lunar ring. 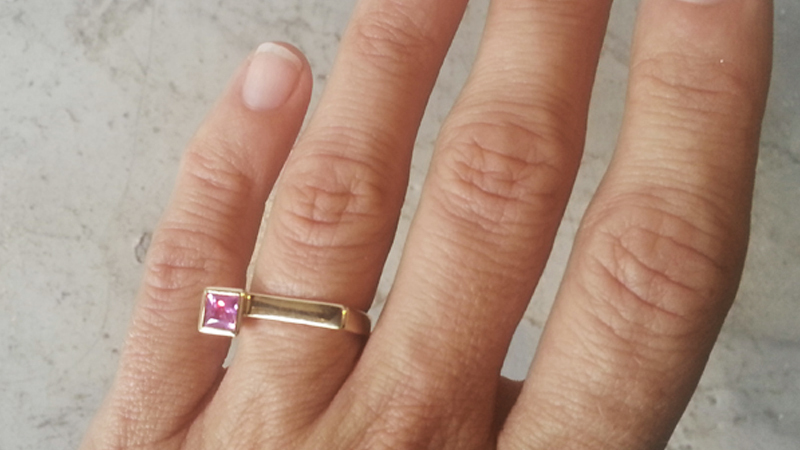 One square, vivid pink sapphire sits on the tip of our classic Cradle design. 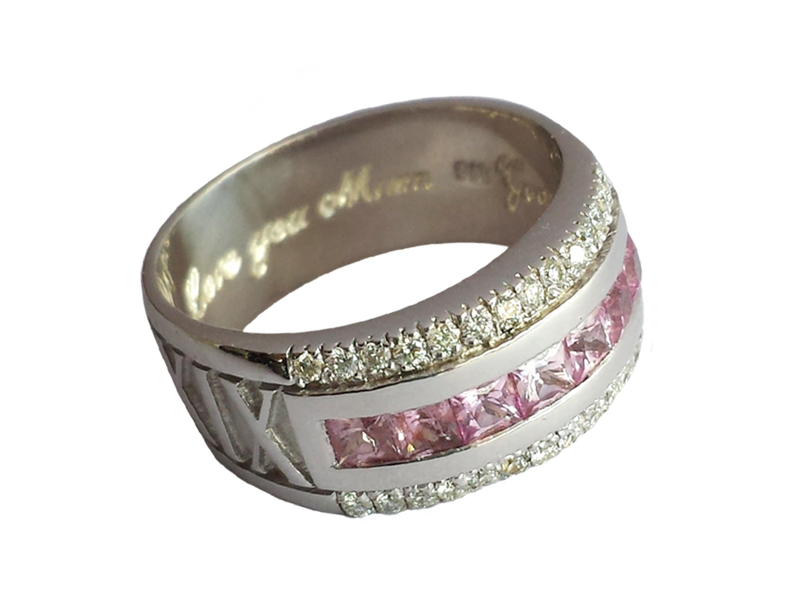 And twelve channel-set pink sapphires were used in a custom designed ring commemorating our client’s mother. Yellow sapphires are fresh and fun – and not to be confused with citrine! 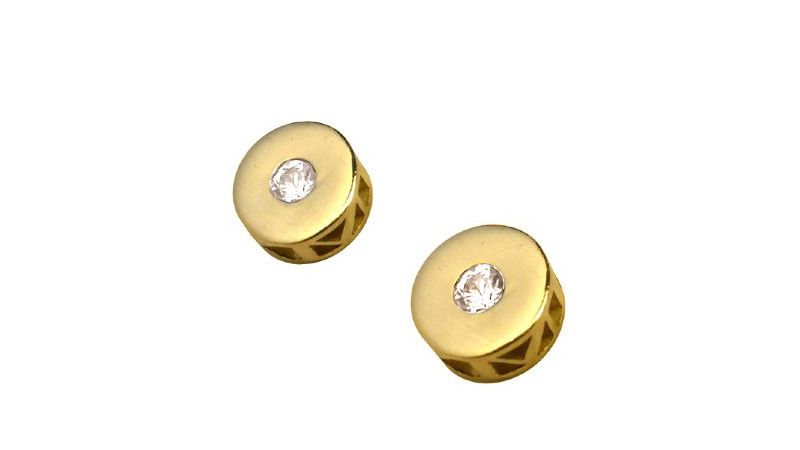 Use them as a bright contrast to white gold or a subtle match with yellow gold. 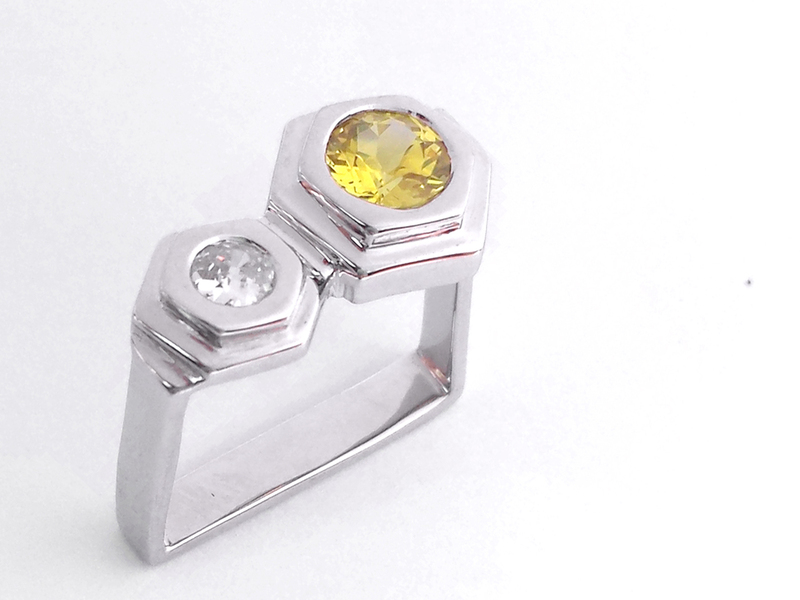 This custom-made hexagonal styled ring represents the idea of ‘day vs. night, summer vs. winter, joy vs. sorrow’, featuring white and yellow sapphires set in white gold. 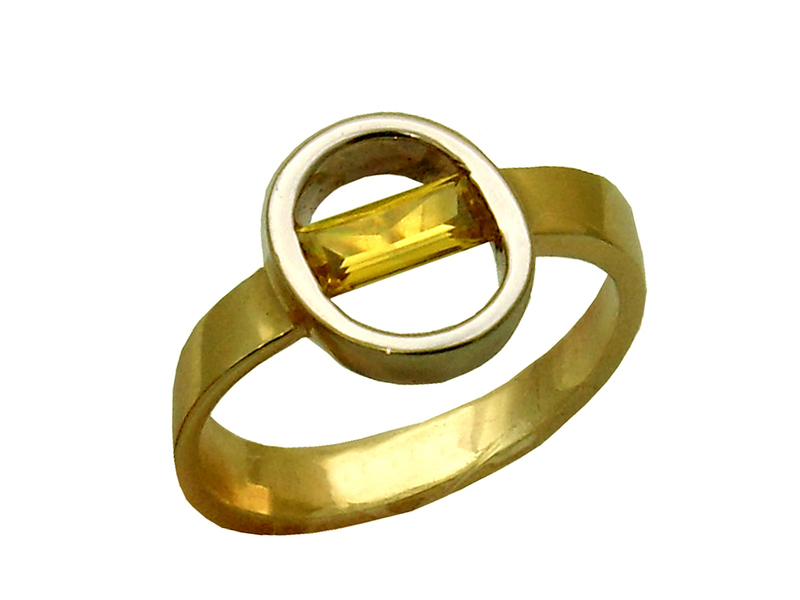 The yellow sapphire in our ‘Trace‘ ring is designed to create the illusion of a continuous band. Deep, mysterious and romantic – green sapphires are a unique and sophisticated choice in jewellery design. Uncommon yet elegant, these marquise-cut gems (below) are beautifully paired with white and rose gold combinations and exude a natural confidence. 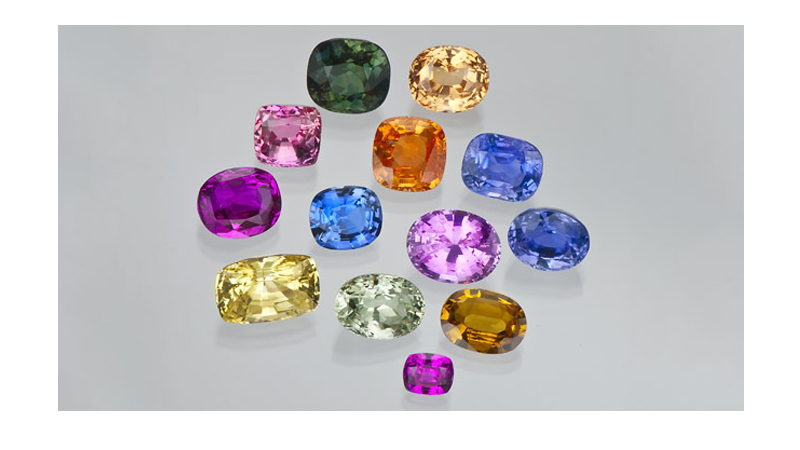 With variations of colour ranging from yellow-green or blue-green, parti-coloured sapphires (top)are always exciting! 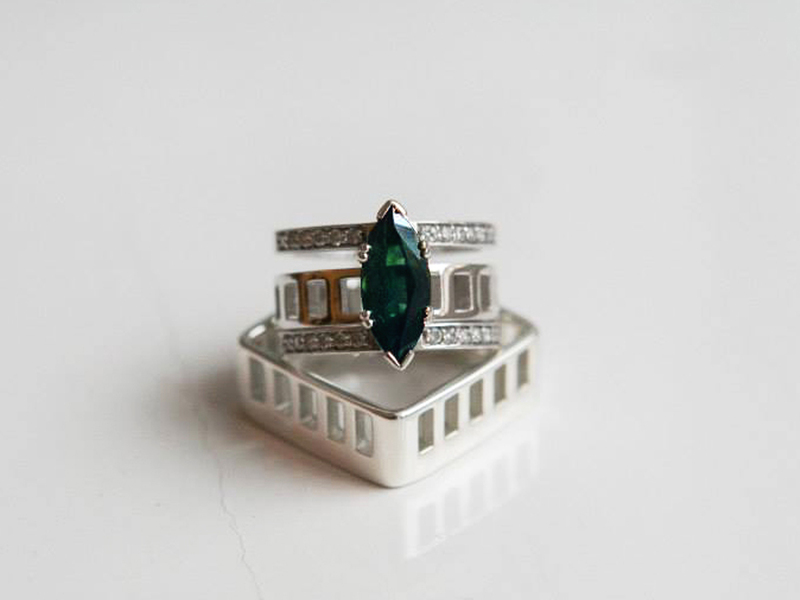 Sera and James’ wedding rings feature a parti-sapphire in the groom’s band and a stunning oval-cut parti-sapphire in the bride’s engagement ring (bottom). 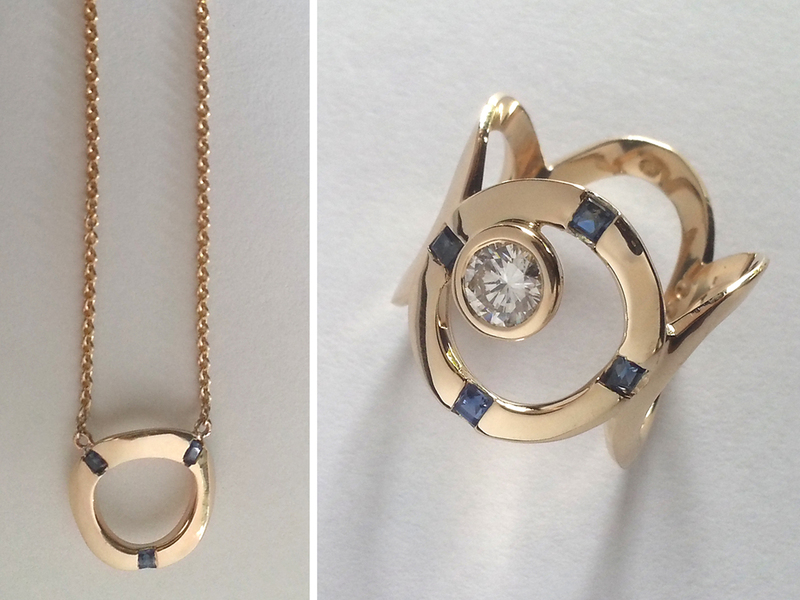 Our Salvation ring (middle) was adapted to hold a cushion-cut parti-sapphire in a unique, geometric design for our client. The most commonly known colour of sapphire, the blue variety offers a range of classic and unique options. From dark Australian blue, to light and fresh Ceylons, blue sapphires have a wide range of personalities! 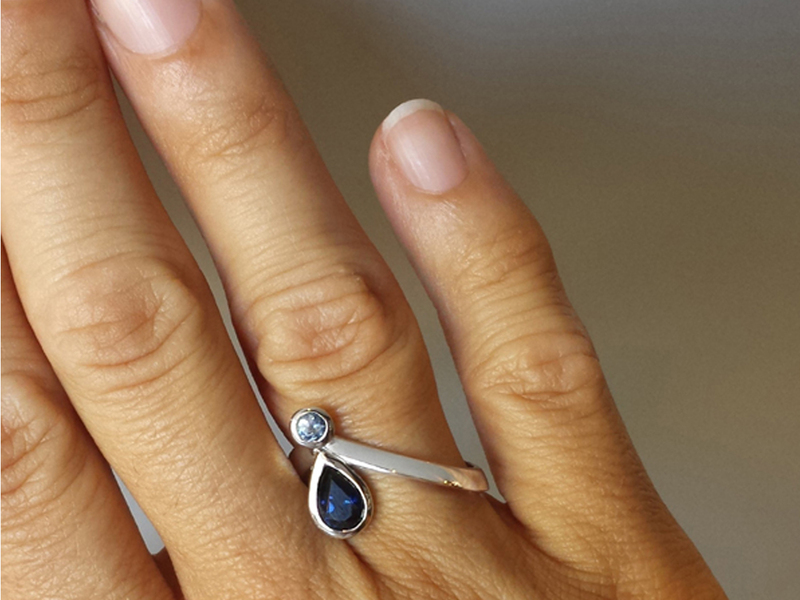 These diamonds and Australian blue sapphire (below) have been re-used from our customer’s other jewellery pieces to create an elegant wedding set incorporating out ‘Cradle’ design. This feminine engagement ring (above) features two stunning Ceylon and Australian sapphires set in white gold with a lovely twisted band. To create the pieces pictured below for herself and her daughter, our client reused stones from her mother’s wedding jewellery. 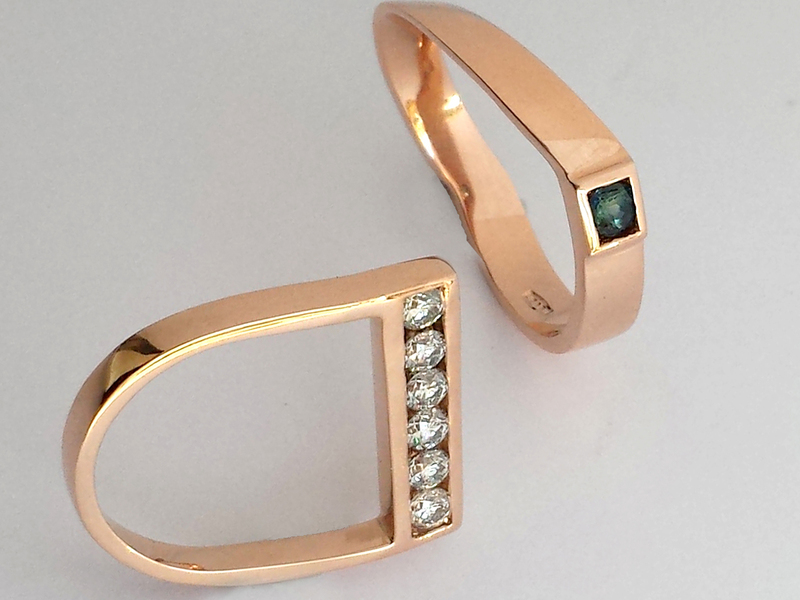 The ring was adapted one of our collection designs: Act Un. 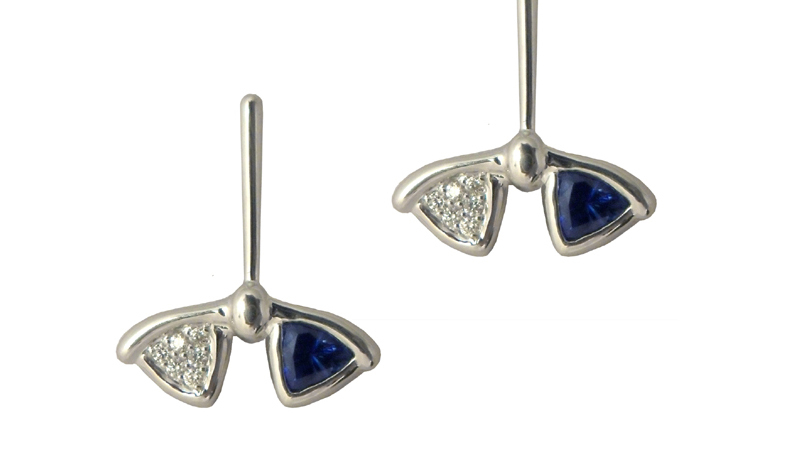 The design for these sapphire earrings was inspired by a family heirloom and echo a traditional mix of white pave set diamonds and rich blue sapphires. But this is where the tradition ends as the trillion-cut stones adorn the earrings in lieu of a typical oval shape, while pave diamonds create a mirrored form to balance the sapphires. 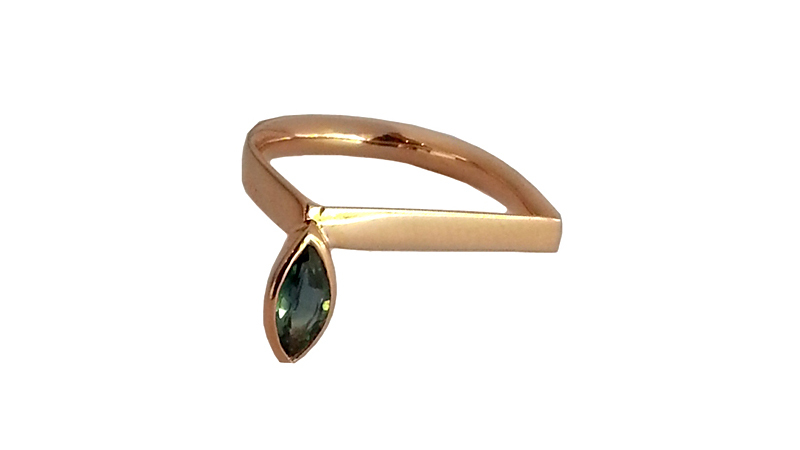 Our striking Ratio stone ring is beautifully handcrafted with your choice of diamonds or sapphires. 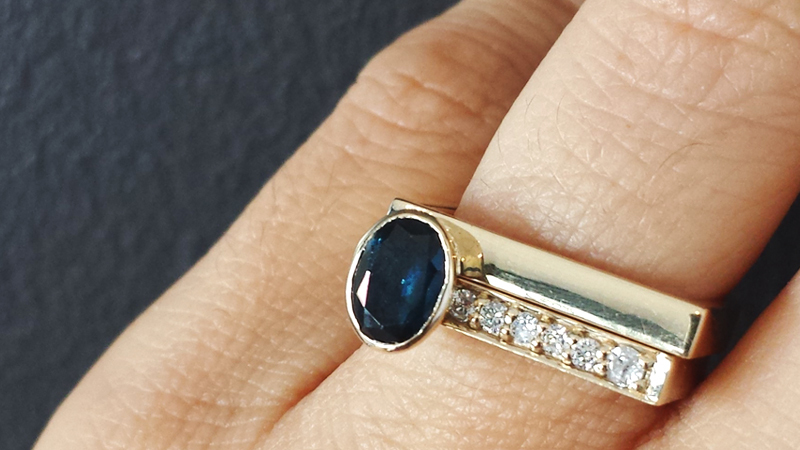 The above ring shows a unique combination of round Ceylon sapphire and pear-cut Australian dark blue sapphire. 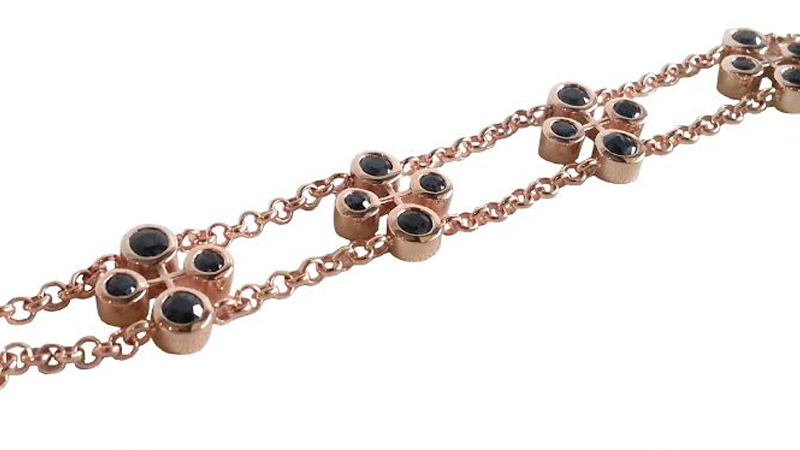 This custom bracelet (below) was inspired by blackberries and features delicious dark blue sapphires! Lastly, this custom engagement ring is based on the idea of the couple being very alike and just a little bit different. 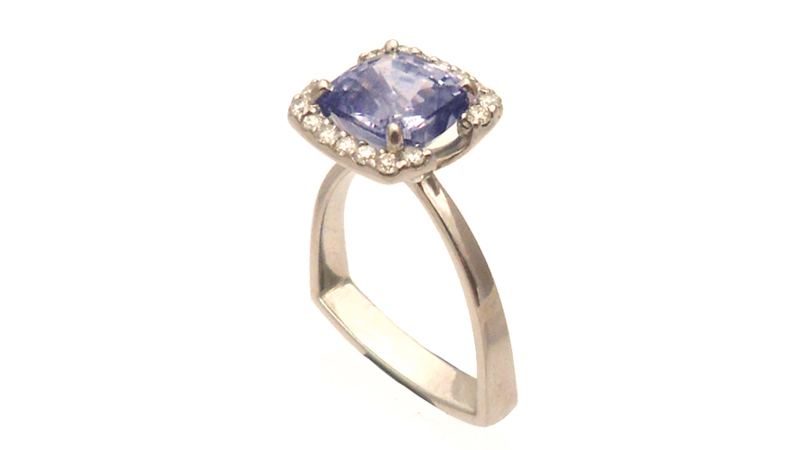 The shape of the large cushion-cut sapphire is repeated in the diamonds that frame it. Yet this ‘halo’ effect tapers back in the centre to break away from echoing the shape of the sapphire completely, thus being a little ‘different’. 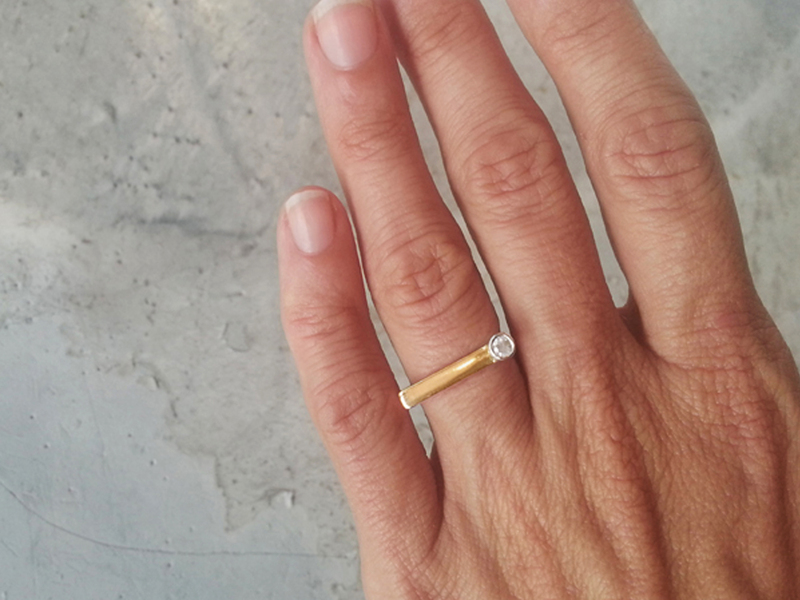 This ring design also incorporates a sense of fun, with the ring shank being a playful shape. The three sides represent three years of being together. 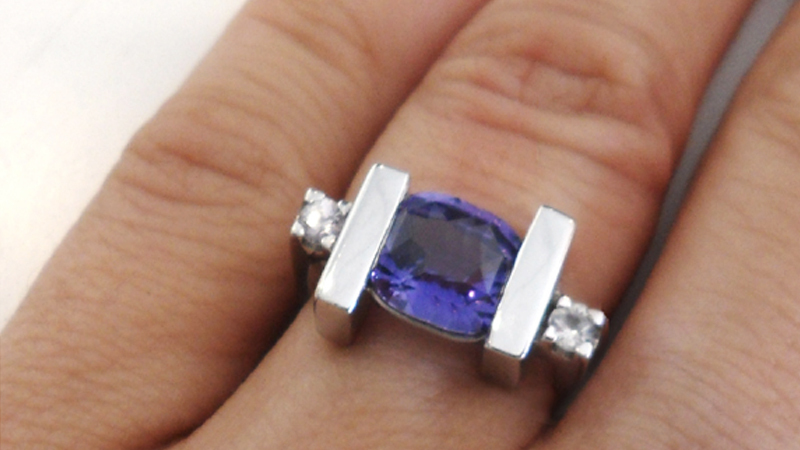 Much less common than traditional blue, purple sapphires are also able to naturally change color in different lighting. Unique in so many ways, this custom cushion-cut purple sapphire engagement ring is supported with two white sapphires. Mined mainly in Australia, the dramatically elegant black sapphire is a nearly opaque stone whose color is so dark that it appears to absorb all light that enters it. While they share the same colour, the black star sapphire is a variety that gains its name from the unique crystal structures that reflect light in the shape of a star. 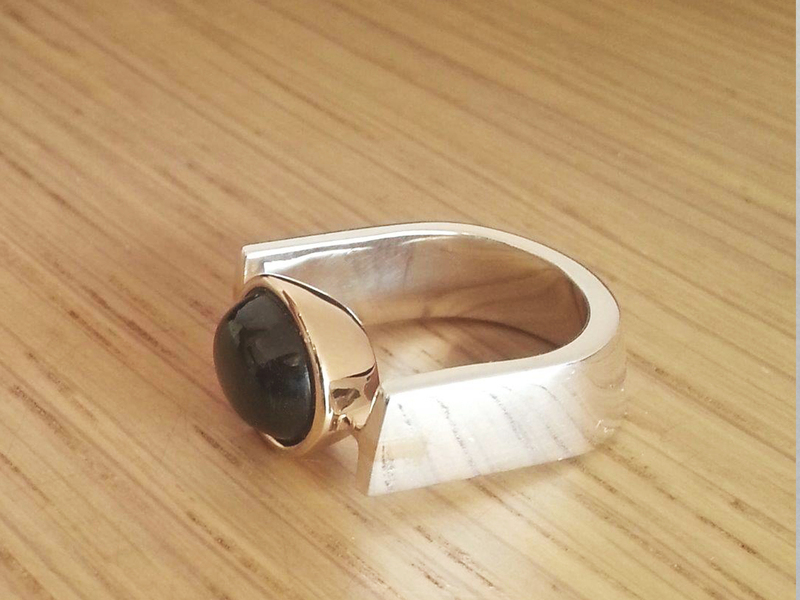 This custom-made ring (below) features a Black Star sapphire cabochon set in a yellow gold bezel. 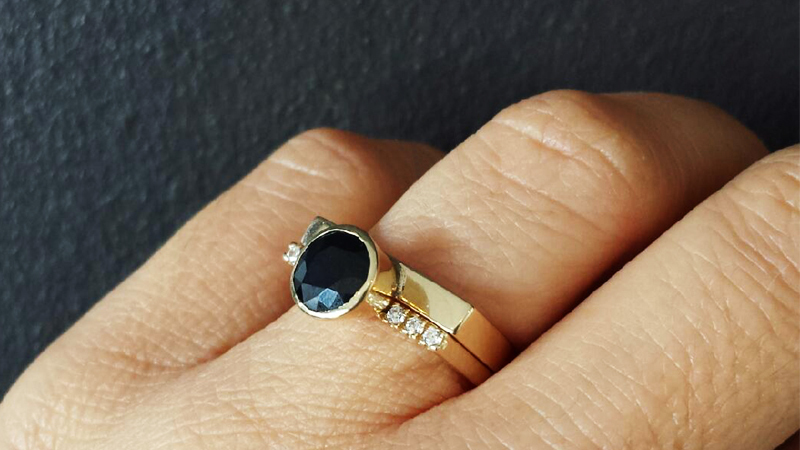 This black sapphire sits prominently in our new ‘centre Cradle’ design and is perfect for stacking with a standard ‘Cradle‘ or our ‘Cradle Pave‘ ring. Available in any colour of stone or metal, what combination would you create? 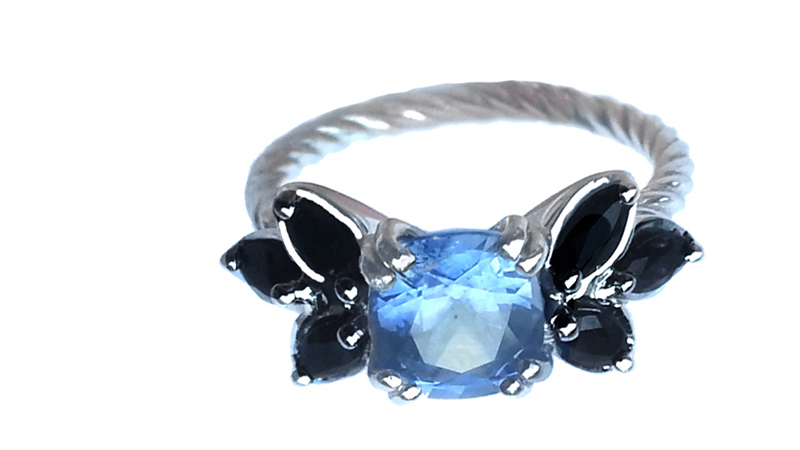 How could we use sapphires in a unique custom-design piece for you? This entry was posted in Products, Special Interest on September 22, 2016 by admin.